For many parents, one of the toughest decisions they’ll ever have to make is whether their child is ready to handle the responsibility having of a cell phone yet. Today, children as young as first and second grade are asking for their own phone and, in some cases, they are getting it. With the rise in school violence and mall shootings, parents seem to feel a sense of relief by giving their children a cell phone and being able to monitor their location at all times. Regardless of the reason and age you deem appropriate to give your child his or her own cell phone, it is wise to give them a cell phone contract to go with it. By giving them a cell phone contract and having them sign on the dotted line, agreeing to all terms and conditions, you are putting the responsibility in their hands. If rules in the contract are broken, consequences will follow, as they do in many real life situations. Below is a general contract that I’ve created for my own daughter and have shared with many friends and family! Use it, make changes to it and add or delete items as you see fit. I will not give my phone number to anyone that I do not personally know well and completely trust. I will have my phone with me at all times. It will remain in my backpack while I am at school and will not come out until school lets out. While I am at church, a movie theater, the library or any other area that requires silence, my phone will be on vibrate or silenced completely. If my parents call or text me, I must answer and/or reply, regardless of where I am. If my phone is protected with a password, I must always provide my parents with it. My parents are allowed to check my phone at any time, day or night. The cell phone is not to be brought to the dinner table at home or while at a restaurant. My phone will be shut off from 9 p.m. until 7 a.m. When I return home from school, I will not use my phone until my homework and chores are completed. I will not use my cell phone to send threatening messages or any inappropriate messages of any kind. If I go over my minutes and/or text messages at any time during the month, I will give my parents the phone until the next billing cycle begins. I will not use my cell phone to take embarrassing photos of myself, my friends or anyone else. I will not use my phone to go on Facebook, Twitter or any other social media site unless I have received permission from my parents. I will not download any apps without first asking my parents for permission. I will always accept text messages from family locator services so that my parents can know where I am. If my voice mail is full, I will delete them. If I receive a message or phone call that scares me, threatens me or offends me in any way, I will talk to my parents about it and show it to them if possible. I will not let anyone else borrow or use my cell phone. If someone needs to make a phone call from your phone for emergency purposes, make sure YOU are dialing the number so YOU know that it is local and not a call that will add charges to your account. If I break the phone, drop it in water, lose it or damage it in any way, I will replace it with my own allowance and/or money earned. If I break one of the rules above, I agree to talk about it with my parents and decide how to make positive changes so it does not happen again. Cell phones today have evolved to serve as much more than simply devices to communicate with. Decades ago, all you could do with your phone was make a phone call. Today, you can send photos, video, email, links to websites, make a movie and so much more. Now, with the evolvement of smartphones and the wide range of possibilities with apps and websites, parents can even use their phone as a tool to help keep their children safe. How do you ask? Take a look at our list of the top 3 apps below! Nearparent is a community comprised of trusted individuals established by the parent to be there for their children and provide care and support wherever children may be. Parents add names and mobile numbers of trusted individuals known as “helpers” (i.e., family members, friends, relatives, etc) that can come to the aid of their child should the need arise. The names and numbers are entered as “helpers” along with your child’s name and mobile number and the service can begin to be used. 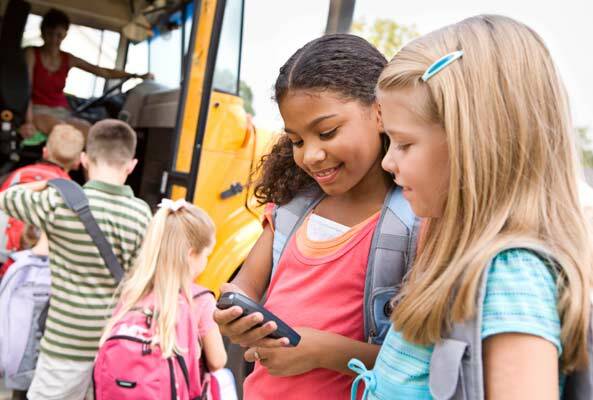 Children can send alerts that are emergent (i.e., feels unsafe, was approached by a stranger) or can wait (i.e., needs to be picked up, needs to be dropped off, etc) and all of the trusted helpers in the network will receive the alert. 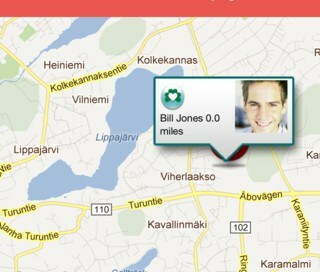 It will appear on a map interface, similar to those on locator services, and any of the trusted helpers can respond. Once a response is received, the child responds by clicking “I’m ok now” and the rest of the helpers network will know that help is on its way. This type of app is ideal for a working mom or dad that may not work near the area they live. If their child needs emergent help while they are at work and unable to arrive quickly, one of the helpers can arrive and put the parent’s mind at ease. The app is free but, once an alert is answered and handled, they ask that you make a donation to one of the charities funded by Nearparent. Quite fair if you ask me! This is one of my favorite’s and one that I have recently installed and activated myself. 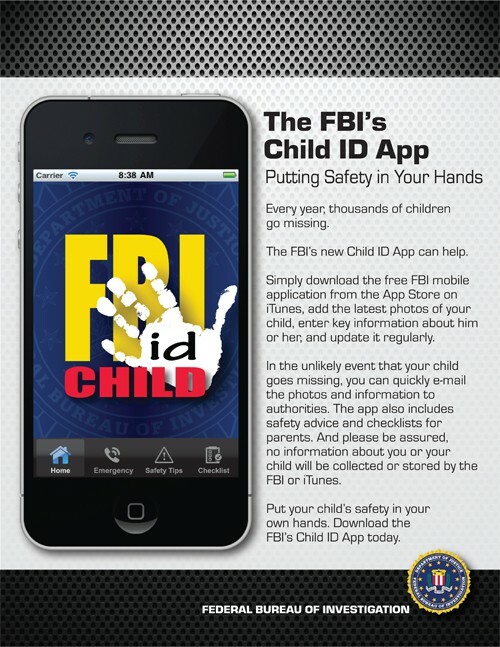 The FBI’s app allows parents to store information their children along with photos in order to have all of it readily accessible in case of an emergency. Information such as a height, weight, hair color eye color, date of birth and disabilities is available instantly and can be sent directly to a local police station or law enforcement agency if the child is missing. In addition, the app provides tips on overall family safety and step by step instructions on what to do immediately if you realize your child is missing. When you think about it, kids can go missing all of the time. 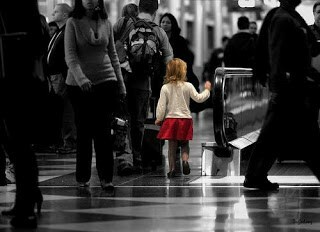 Trips to the mall, amusement parks and school trips often result in temporary cases of missing children. These are ideal times to use this app and find your child as soon as possible. 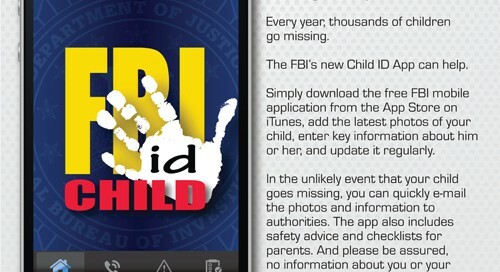 The best thing about this app is that it was created by the FBI and it’s absolutely free! This app is similar to Nearparent but much more involved and with many more features. It is also exclusive to iPhone users. Hero has the capabilities to send parents, friends, family and neighbors real time streaming video, audio and GPS directly from your child’s phone. This is an invaluable tool when your child is older and may drive home late at night, have a long walk from a friend’s home or school or is the victim of a crime and needs to alert someone immediately. With Hero, your child simply taps the “Hero” button and an alert is sent out immediately to anyone around and in the trusted community in seconds. 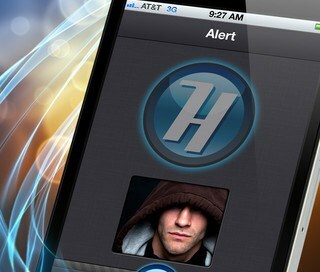 Similar to Nearparent, the parent sets up the trusted list of people that receive the alert and are able to respond. If the child is lost or missing, an alert with the child’s picture and location goes to anyone within a five mile radius. 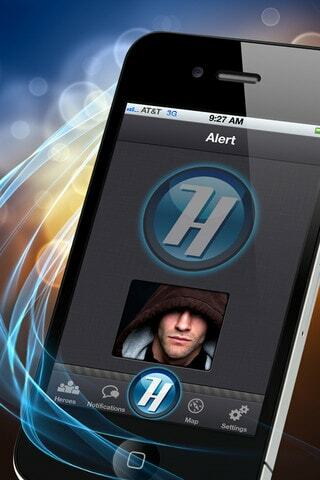 Once the child is found and help has arrived, the alert is solved and data erased. Best of all, the alert sent (i.e., video, GPS location or audio) is saved in the infamous Apple Cloud, so it is accessible even if the child’s phone is damaged or misplaced. For now, the app is absolutely free. I’m assuming this may change since it has received rave reviews and is very popular many parents. This is one app that is tempting me to switch from an Android to an iPhone asap! With so many different ways to use your smartphone as a valuable family safety tool, it’d be a shame for all parents not to take advantage of these, often free, tools. The apps above can literally save your child’s life one day.  In addition, there are also a wide variety of family locator apps and services that can be used even without a smartphone, such as LociLoci. These can give you real time GPS location of where your child is at or was most recently at. This information can help you and law enforcement in the instance that your child needs to be found immediately.